I buy golden beets regularly because they’re incredibly nutritious and I love their sweet and earthy flavor. I also love their shape and color. Almost without fail, I roast them to use in a salad of some kind, but I’ve also been known to eat one as a snack every once in a while. Roasting beets requires almost no effort at all and they’ll keep in the refrigerator for several days. I don’t know about you, but I really enjoy eating foods that taste good, but are also beneficial to my health. Beets, considered to be a superfood, possess many health benefits. Not only do they contain ample quantities of antioxidants, but they are liver-protective and serve as a detoxifier. Studies suggest that beets offer protection against heart disease and stroke; lower cholesterol levels; and have anti-aging effects. Do I need to continue making the case for beets? Beets really do get a bad rap and many people have a preconceived notion about them. I’ve heard that they taste like dirt and some people are put off by the color of red beets. I would suggest to all the beet haters that you give them another chance, if for no other reasons than the health benefits. If well-prepared, beets are a wonderful addition to any meal. 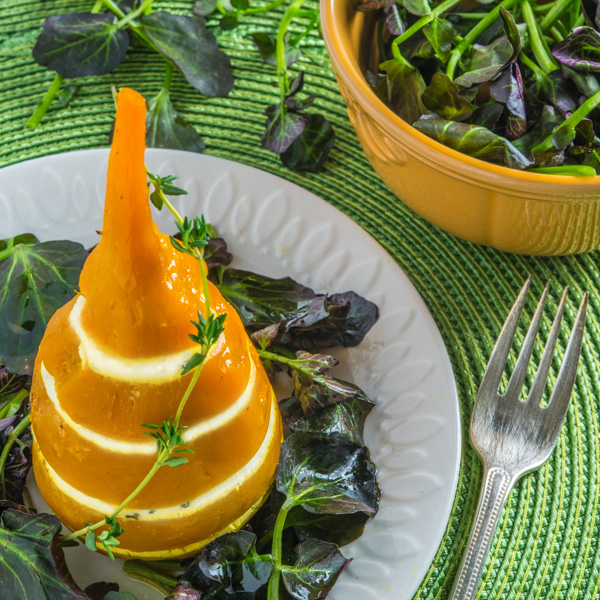 I posted a Golden Beet Salad with Pistachios and Goat Cheese several months ago and this recipe is a variation on that theme. For this post however, I wanted to build something that was visually impressive. I tried this recipe with red beets, but I ended up with pink goat cheese! Golden beets worked much better, but if you don’t mind pink goat cheese then by all means use red beets. I infused the goat cheese with thyme which added a subtle earthy background flavor. After I made this dish, I really had no idea what to call it. Jim and I tossed around several ideas, some of which were totally ridiculous, but we settled on Beet Crowns. This recipe requires a little work to put the beets together, but as they say, you eat first with your eyes and it really is worth the effort. These beets can be made ahead and refrigerated for several hours before serving. You’ll impress your dinner guests with this beautiful first course. 1. Preheat oven to 400 degrees. Tear six squares of aluminum and place a beet on each square. Drizzle a little water on each square of foil and wrap beets securely. Place wrapped beets on a baking sheet and roast for 45 minutes to 1 hour, depending on the size of the beets. Remove from oven and let cool. 2. Whisk vinegar, mustard, honey, 1/4 teaspoon salt, and pepper together in a small bowl. Drizzle olive oil into the bowl in a slow stream, whisking constantly. Refrigerate dressing until ready to use. 3. Place goat cheese, thyme, and 1/4 teaspoon salt in a small bowl and blend with a fork. 4. Peel beets with your fingers. Skins should pull off very easily. Slice beets into 4 or 5 slices, keeping them in the order that you sliced them. Place a dollop of goat cheese on the bottom slice and spread to the edge of the slice. Top with next slice and repeat until beet slices are put back together separated by goat cheese. Smooth the goat cheese layers with your fingers. 5. Drizzle watercress with dressing and divide between salad plates. Place a beet on each plate and drizzle with dressing. Garnish with a sprig of thyme and serve immediately. Holy cow what an impressive dish! Beautifully done! Great looking dish! I usually buy red beets, but I sure won’t turn down the golden variety (and I see them often in restaurants). Beets and goat cheese really do make a super combo — love their flavors. This is a great recipe — thanks. This is so stunning! I could imagine serving this at a dinner party. I am seriously impressed! !